We frequently eat grilled chicken throughout the year, cooked either outdoors or on an indoor electric grill or grill pan. We probably create or modify a new marinade at least once a week during the summer months. This basil chili marinade was a recent discovery that actually turned out to be a hit with the entire family—and it is often a feat to please our middle little one. The basil chili sauce for this chicken is sugary—and tends to stick during cooking--so, while it could be baked or pan fried—I would recommend grilling it outdoors with aluminum foil for easy clean up. Prepare the Basil Chili Sauce marinade. In a mixing bowl, add the chili sauce, oil, broth, basil, garlic, salt and pepper. Whisk to combine. Save 1/2 c. of the marinade for basting during grilling. Marinate the chicken breasts. Place the chicken in either a large, zippered bag or a large bowl with a lid. Pour the marinade over the chicken. Turn the meat to coat. Cover or seal and refrigerate for at least four hours—turning occasionally or shaking to ensure that both sides of the meat soak evenly in the sauce. Grill and serve. Grill over medium heat for 3-4 minutes on each side, basting each side during turns. Then reduce heat to low and continue grilling until the chicken reaches an internal temperature of 160F, turning every 4-5 minutes and basting with reserved basil chili sauce marinade. 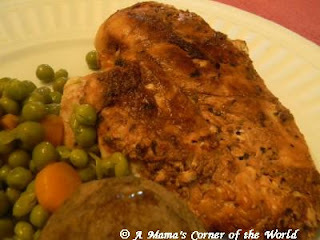 We serve the chicken breasts with baked potatoes and grilled vegetables or buttered peas. The chicken remained saucy with basting—but, if the chicken seems a bit dry, warm a little of the reserved sauce to drizzle over the chicken prior to serving.